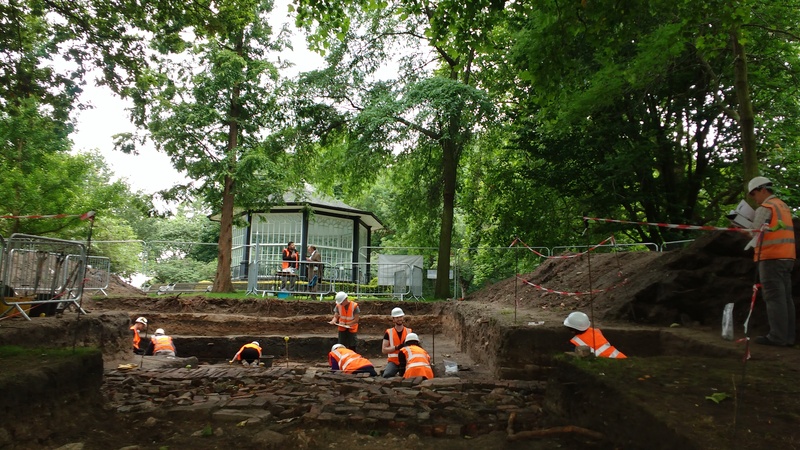 Over 100 trainees excavated in the Royal Castle of Nottingham's Outer Bailey in 2017. Thus, we know from archival sources that all or part of the Outer Bailey was in the 15th century being used for grazing. It is likely that in the following century, during the English Civil War, the Outer Bailey became the site for the gun platform battery that the Parliamentarians set up in 1643. Subsequent records show various servants and their families living somewhere in the Outer Bailey in the 17th century (a trend that continued into the 18th century), and pictorial evidence indicates that in or by the 18th century this part of the Castle site was under cultivation. Pictorial depictions suggest that planting might have observed neat parallel rows that ran down Castle Hill. It is not clear for how long this lasted, however, as it seems that by the later part of the 18th century all or part of the Outer Bailey had become tenanted private gardens. 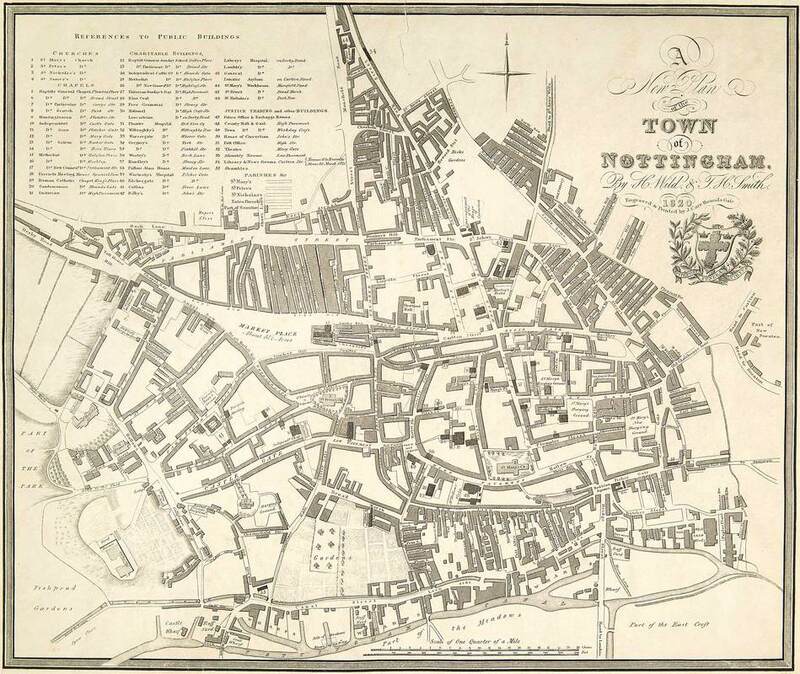 We know of tenants in the 1820s, for example, and the First Edition OS map of 1880 shows the whole Outer Bailey divided into probable allotments or town gardens. There are many questions, however, that these limited sources cannot answer. 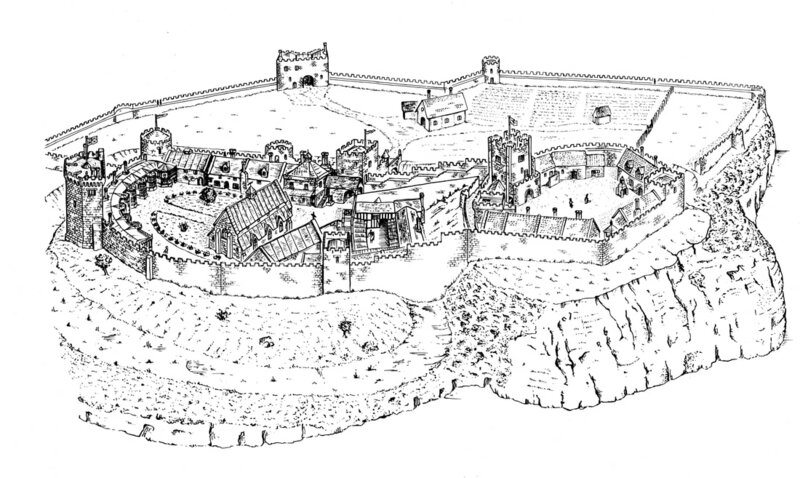 Was the Outer Bailey in use before the 15th century, did it undergo the late medieval decay that occurred elsewhere on the site and how was it affected by (and what role did it play in) the English Civil War of the 1640s? What happened here when the medieval Castle and its defences were 'slighted' in 1651, where was the accommodation of the servants or retainers of the Ducal Palace situated, and when did the Outer Bailey become formal gardens and, subsequently, an apparent area of cultivation? In addition, how was the Outer Bailey changed when it was brought back into the site in 1908, and has any evidence been left of the military activity that took place at Nottingham Castle in both the First and the Second World Wars? These are questions that We Dig the Castle trainees are helping to answer. In the base of the trench: a number of trough-shaped pits and both northwest to southeast and northeast to southwest linear features. Although the features were extensively excavated the relationships between these remains to be determined. The discovery of clay pipes dating to the late 17th century in several features indicates an association with the Ducal Palace (built in the later half of the 1600s). At present it seems probable that these features are bedding trenches for garden features and that they relate to the 18th century changes in usage and cultivation. A curvilinear feature found in the base of the trench is believed to be the earliest identified on site, although there is no evidence as yet to its date. Above the linears: deposits relating to the Victorian allotments or town gardens, including the brick cill wall of a structure shown on the Ordnance Survey map of 1880 and thought to be a probable greenhouse. A small square structure had been added to the building as depicted in 1880, and probably housed a stove. Overlying the greenhouse: a northwest to southeast aligned brick surface. Carbon arc rods of a type used in lighting were found in the vicinity, suggesting that the feature could have been hard standing for spotlights or searchlights. These lights are known to have been present on the site in 1937 and during the Second World War, in use by the 42nd (Robin Hood) Anti-Aircraft Battalion. Covering the entire site: a series of 20th century landscaping layers, full of redeposited pottery dating from the medieval to modern periods. What's happened in the trench this week? Our trainees have had another full week, with excavation, cleaning and recording in the trench, sieving, finds washing and processing, work on environmental samples, surveying, walking tours, workshops and tutorials, all supported by tutors Laura, Richard, Tristan, Rosie and Norma and the specialists who have delivered tours and sessions. We've had visits from invited guests and the Thoroton Society and were interviewed for BBC East Midlands Today. We've also been featured by the Nottingham Castle Bid's Tween Twitter Takeover team. In addition, the fancy fuddle, 'Posh Lunch Thursday', has, of course, come back, and towards the end of the week we even saw the sun return! ​What's happened in the viewing platform? Our fabulous Explainer volunteers have also been kept busy. We've had a regular flow of visitors to the Castle site who have come to the trench to see what we're up to. Once or twice there's even been a queue to get into the viewing platform. Visitors have included a mixture of local families, day trippers, and holidaymakers from further afield - including people from countries such as America, Australia, New Zealand and India. They've offered us some great suggestions for interpreting our features, and expressed a real eagerness to find out what happens next. If you too would like to hear about our analysis and conclusions as we process the results don't forget to return to this page in future for the latest news. Our trainees are continuing to work in this part of the trench, excavating, cleaning and recording what we still believe are two separate sets of features. Current hypotheses continue to suggest that they are most likely linked with cultivation, potentially as bedding trenches. 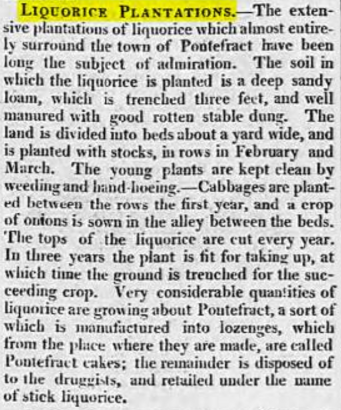 One intriguing new suggestion about liquorice cultivation came from the Thoroton Society when they visited on Friday. We know that liquorice was grown in the Park (now the Park Estate) in the 18th century. It was also widely cultivated in Worksop, and planted at Welbeck Abbey. 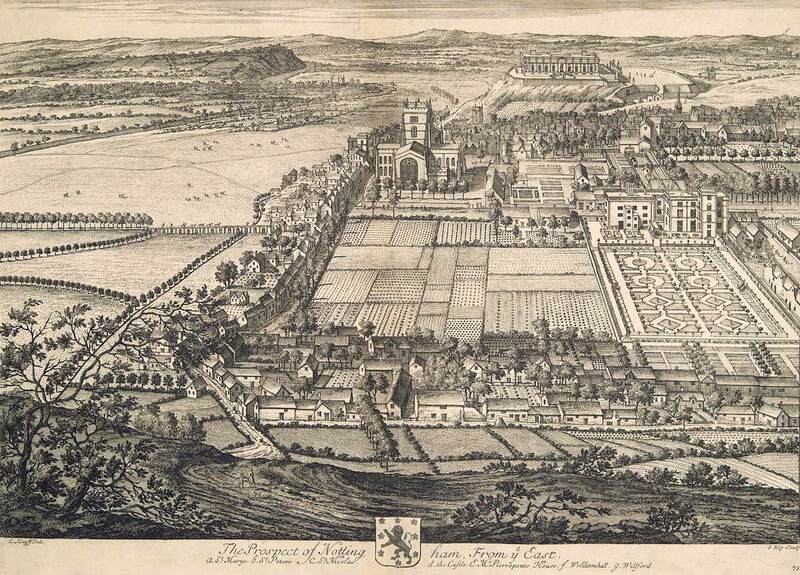 With the Dukes of Newcastle owning both Welbeck Abbey and Nottingham Castle might they have brought liquorice to the Castle site, and experimented with its cultivation? With liquorice often grown at 3 spades' depth and width could our troughs or trenches be the right dimensions? This is one interesting, and potentially fruitful, suggestion, and we would welcome any additional ideas. The discovery and identification of the carbon arc rods has had real significance for our interpretation of the brick and rubble layer in the east of the site. At present we have comparatively little positive evidence by which to interpret this feature. The re-used and re-deposited bricks and stonework cover a range of ages and may be the product of the demolition of garden buildings and structures. The structure itself appears to have been constructed on the site of a former building indicated on the OS map of 1880. Its long and narrow dimensions (exceeding the width of the trench), and lack of foundations, seems to suggest a potential track or path, although we have no evidence of this on the available maps. One possibility that we are now exploring is the link with spotlights or searchlights, which commonly used carbon arc rods as their light source. Could this have been a roughly-formed platform for a spotlight emplacement, creating a standing for the vehicles by which they were transported? In December 1936 the 7th Battalion the Sherwood Foresters had become the 42nd (the Robin Hoods) Anti-Aircraft Battalion, Royal Engineers. A cursory look at the available archival sources has already shown the use of spotlights on the Castle site at the Coronation of 1937, during the Second World, and in the National Savings Week of 1949, although their exact location is in many cases unclear. We would like to hear from anyone who may be able to cast further light on the use of spotlights, searchlights or floodlights on the Castle site. Next week is the final week of We Dig the Castle 2017 for our trainees and Explainer volunteers. ​The dig will finish on Friday 18 August. 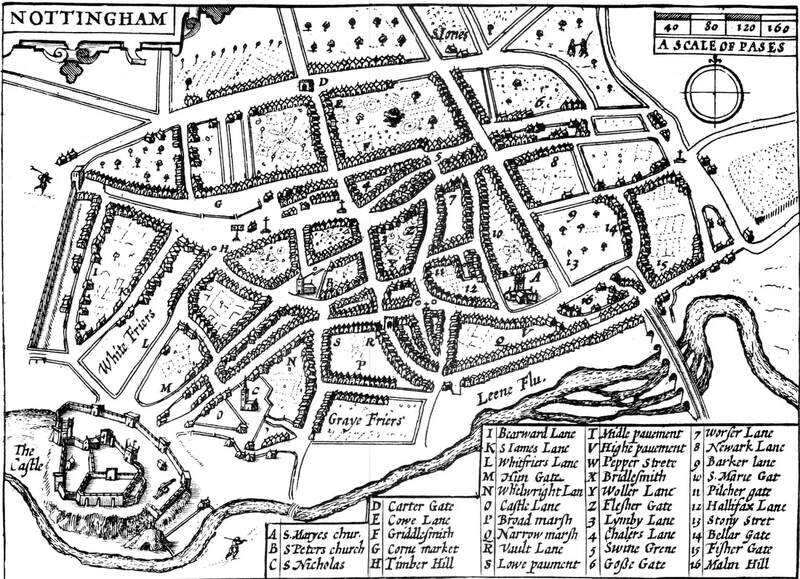 On Wednesday 16 August we're looking forward to a visit from the Nottingham Civic Society, followed by the Southwell Community Archaeology Group on 17 August. If you're in the Castle site at any time on Monday-Friday next week why not come up to the viewing platform and see what we're up to! It's been another busy week for our We Dig the Castle trainees, supported by archaeologists Laura, Richard, Tristan, Paulina and Vicky. ​What’s happened in the trench this week? In the main (western) part of the trench trainees have continued working on what appear to be two separate sets of features, one running west-east (from the Ducal Palace towards the curtain wall) and the other north-south (towards the gatehouse). A narrow extension was created at the east (running towards the curtain wall) to investigate whether these features continue on the other side of the brick layer. 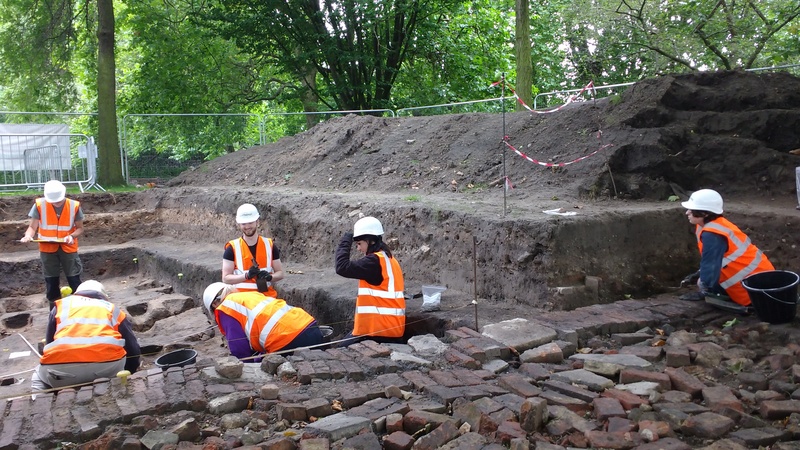 Trainees have also continued cleaning and recording the large brick area that runs north-south across the trench. To identify whether the line of bricks continues to the north of the trench a narrow extension has also been opened in the northeast corner. Several of these features have now been excavated and recorded. They appear to be deeper than those running west-east, and have yielded a number of clay pipes from within their fill, the majority seeming to date from the 17th and 18th centuries. Excavation has also shown that these north-south features are not continuous, but instead form discrete troughs or trenches. They also seem to share a fairly consistent profile, with deep, steep, sides that flare out at the top. We hope that further excavation and recording, combined with environmental sampling, will cast more light on their purpose. In the east of the trench the 2016 trainees uncovered an area or surface of rough brick and rubble infill. This is bordered on the east and west by parallel lines of more carefully-laid brickwork. Initial interpretations had suggested that this could possibly be the rectangular building with a projecting square structure shown on the OS map of 1880. Three recent developments have, however, led us to revise this interpretation. The bricks have been shown to continue to the north of the trench, suggesting that the feature may be much longer than the building shown. Cleaning has also revealed that this re-used brick and worked stone is set directly onto garden soil, which appears similar to the dark 19th century allotment layer in the west. In addition, work at the immediate west has uncovered what may be a building base lying beneath the brick surface, and the remains of a protruding brick-built square structure. This bricked area has not yet been identified on the available maps and plans. However, our new evidence raises the possibility that it was placed here in the late 19th or early 20th century, on the site, and after the demolition, of the building existing by 1880. With no foundations apparent its purpose is still to be ascertained. Trainees have been able to take part in a range of workshops and tutorials, in areas including stratigraphy, surveying, finds identification (bones, pottery and clay pipes) and site photography. They've also enjoyed tours of the Castle site, Mortimer’s Hole and the Anglo-Sacandinavian borough (now part of the Lace Market), and have been processing environmental samples. Any organic material, such as seed pods, could help to cast light on the use of the features in the main part of the trench. We also ran our first Saturday training session on 5 August, welcoming a mixture of regular trainees and new faces. Amongst our trainees were three young people, aged 10-14, who had won a day at the dig as part of the Young Archaeologists’ Club’s Dig it! with YAC competition. Georgina, Kian and Phoebe worked hard to clean bricks and sieve spoil, took part in a pottery workshop and enjoyed a tour of Mortimer’s Hole. What artefacts have we found? As in previous years the excavation is yielding a great variety of artefacts. This includes brick and other ceramic building material, glass and metal. Particularly significant are the clay pipes, which are useful dating evidence, and the pottery. The pottery ranges in date from the medieval period to the 19th/20th centuries and includes a quantity of medieval Nottingham splashware. ​A number of mystery finds have also been uncovered, primarily in the northeast corner. One suggestion is that they are carbon arc rods. Who are we? 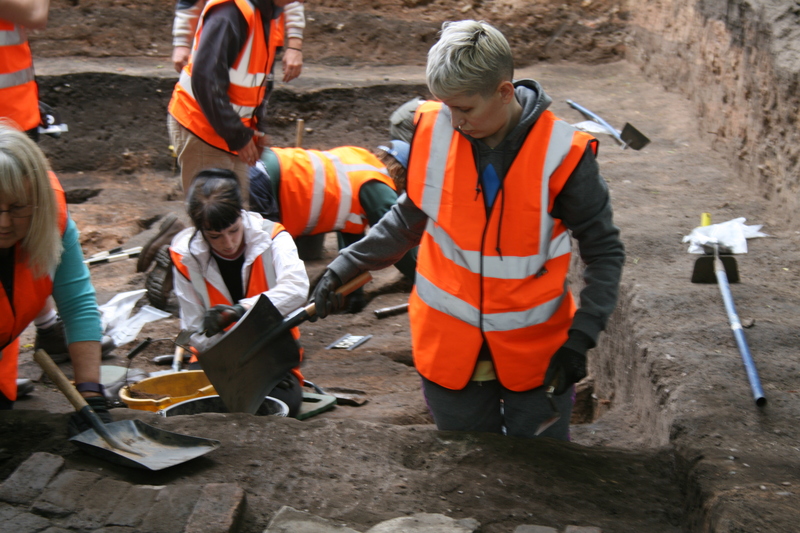 Each day we have 13 trainees, an Explainer volunteer and staff from Trent & Peak Archaeology (TPA) on site. Our Explainer volunteers are volunteers with Nottingham City Museums & Galleries (NCMG) and TPA and help to record the dig in our dig diary and in video and photos, explain the excavation and the history of the site to visitors, and share some of the artefacts discovered. We’d like to thank Nottingham City Council for providing a funded place for an NCMG volunteer employee to train with us each day. What are we doing? Trainees, supported by TPA archaeologists, are carrying out every stage of the excavation. They’re excavating, cleaning, planning, recording, drawing and photographing, sieving spoil, washing and processing finds, metal detecting and wet sieving soil for environmental samples. They’re also taking part in workshops and tutorials in areas such as stratigraphy, finds identification (bones, pottery and clay pipes), flotation and site photography. 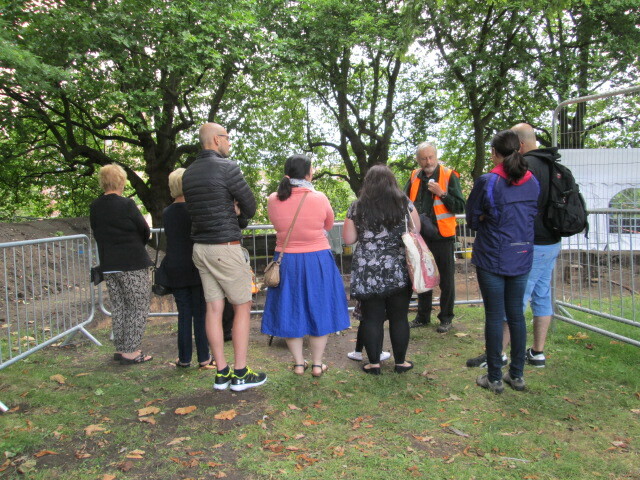 Those wanting to find out more about the historical context are participating in tours of the Castle site, the Anglo-Scandinavian borough of Nottingham, and the cave system running beneath Castle Rock. Where are we excavating? Our trench is located in what would have been the Outer Bailey of the medieval Castle. In 2015 trainees excavated a rectangular trench running north-south. To investigate the possible continuation of features uncovered in 2015 this was extended eastwards in the second year. In early July 2017 Trent & Peak staff, helped by a JCB, then emptied the trench of the backfill added at the end of the previous season, ready for trainees to start afresh. What progress have trainees made so far? In 2016 trainees reached what have provisionally been identified as potential garden features, possibly associated with the 17th century Ducal Palace or 18th century allotments. Our new trainees have cleaned, photographed and recorded these features and are now beginning to excavate them. Clay pipes provisionally dated to the 17th century seem to indicate an early post-medieval date. In the east of the trench trainees are cleaning and recording the bricks that may be associated with a summerhouse or greenhouse. Maps of the 19th century show several such structures in the general proximity of the trench. Artefacts found on and between the bricks are similarly being processed, and may help to date the structure. 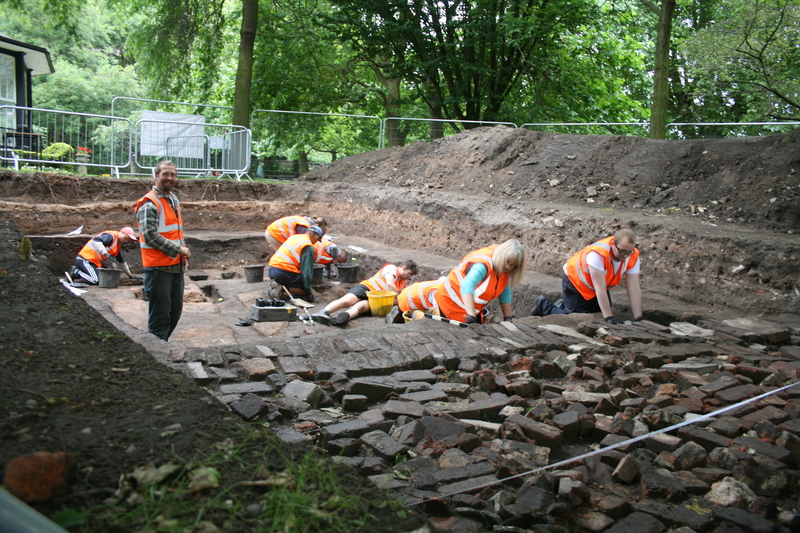 Trainees are also now excavating a rubbish pit uncovered at the immediate southwest of the bricks. Trainees have also created a narrow extension north of the bricks, to investigate their northern limit. Removing the turf and topsoil of a similar extension at the east, they quickly uncovered an area of collapsed stone and lime mortar. This structure will be investigated further over coming weeks. What else has been happening? The Explainer volunteers have been busy every day. We’ve had lots of interest from visitors to the Castle, including many school groups and international visitors. Supported by our Explainer volunteers, visitors are seeing the dig in action, finding out about the history and archaeology of the Outer Bailey and the Castle site more broadly, and handling finds. 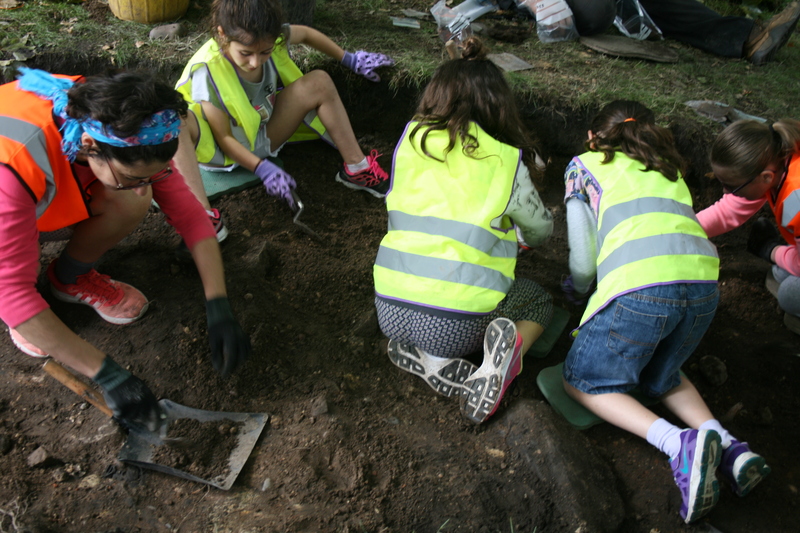 On Saturday 22 July we were joined by Nottingham Young Archaeologists’ Club, while on Sunday 23 July more young people and their parents came for our Festival of Archaeology event. You can see photos of both days in our dig diary. You can also watch us on Notts TV and read about visits from Visit Nottinghamshire and the Castle Transformation team. We’ve also welcomed Hucknall U3A History Group, Nature in Mind (a Framework service supporting people with mental health difficulties) and a group of international scholars joining us through the University of Nottingham. What’s coming up in week 3? On Saturday we’re looking forward to welcoming not just our trainees but also 3 young winners of the Dig it! with YAC competition – Georgina, Kian and Phoebe. We'd like to thank our trainees so far, the Explainer volunteers, all those who have come to deliver specialist activities, the supporter who has provided trainees with a marquee, the groups and visitors to the site who have joined us, and the staff from Historic England, NCMG and Nottingham City Council who continue to offer support and share their expertise.